Our white magnetic sheeting comes in a variety of thicknesses, widths, lengths (by the roll or per metre), and has a gloss white PVC coating. White side is non-magnetic. It is constructed from Strontium or Barium ferrite powder within a polymer matrix. This white magnetic sheeting is manufactured to provide good demagnetization resistance & reasonable resistance to chemical agents. It can be stamped, slit, punched or laminated, providing a superior product for magnetic signs at your office, warehouse or home. It can be easily cut with guillotine, scissors or Stanley knife. 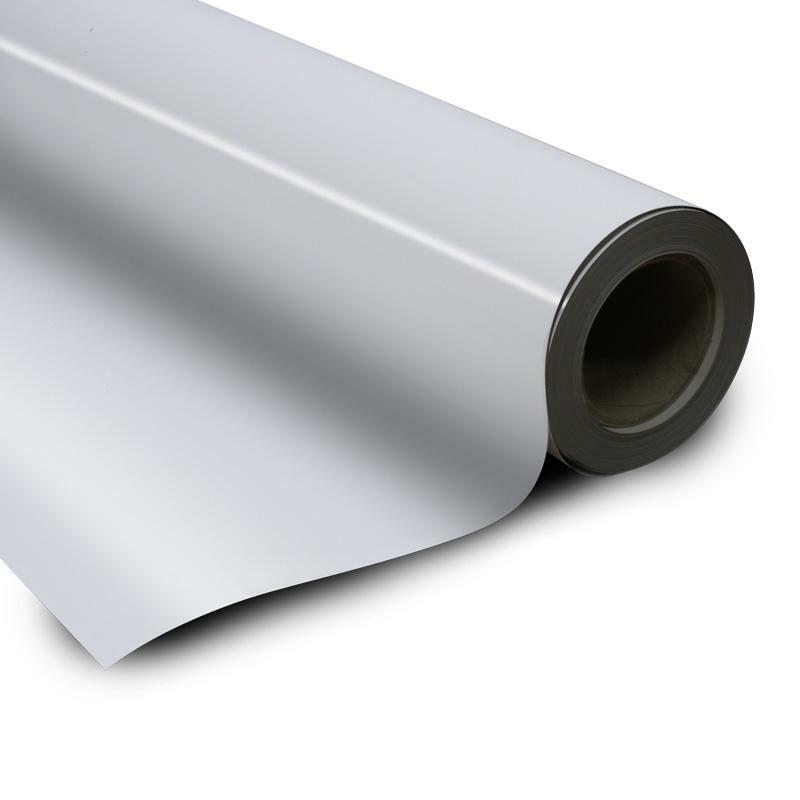 White vinyl magnetic sheets allow printers to print directly onto the magnetic sheets. This makes printing much quicker as printers don’t have to laminate the plain magnetic rolls themselves. 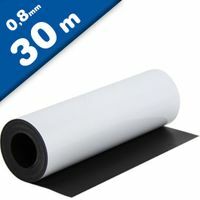 Our white vinyl magnetic roll has a strong holding force, making it perfect for printing retail POS, posters and other graphics. Using a magnetic sign has the great advantage that the sign can be quickly easily removed and then reapplied as required. The magnetic material can easily be cut to size and will not scratch or mark the surface if the care instructions are carefully followed. The magnet material is designed for outdoor use and will not rust and the magnetic holding strength does not reduce over time so your customers can use the signs again and again. Our customers often use white vinyl for retail displays and is very popular for creating magnetic vehicle signs. The vinyl is suitable for (eco) solvent, UV and screen printing. 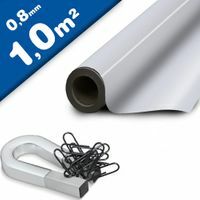 Flexible vinyl sheet is magnetic rubber which has a bright gloss coloured vinyl top layer. The Natural version is plain (no vinyl, no dry wipe finish) - you can add your own artwork onto this. We can also print and cut out your own artwork onto the magnetic vinyl and add extra features such as dry wipe, magnetically receptive printed top layers, etc and we can cut to shape as well if required. The flexible magnet sheet is magnetic on one side and white, printable vinyl on the reverse, and is suitable for creating magnetic signage. It has a strength rating of 85 pounds of pull per foot. The sheet withstands temperatures from 0 to 150 degrees F. Flexible magnets can be easily cut and shaped to size using scissors, trimming knives or roller cutters for a range of applications. They are produced by mixing powdered iron or ferrite with a rubber or plastic binder, and then extruding or rolling into the desired shape. Flexible magnets can have adhesive backing and be laminated with a printable vinyl coating. Flexible magnets are typically magnetized with multiple poles on one surface to generate a stronger holding force. High-energy flexible magnets can sometimes be used in place of ceramic materials if tight tolerances are not required. The application temperature range is determined by binder material properties. Ideal for charts,planning boards,magnetic signs,games and puzzles.